Get a vintage mirrored finish with this easy to make vase. Wash the vase, inside and out, with Dawn dish liquid to remove all dirt and oil. Let dry. Wipe down all vase surfaces with alcohol. 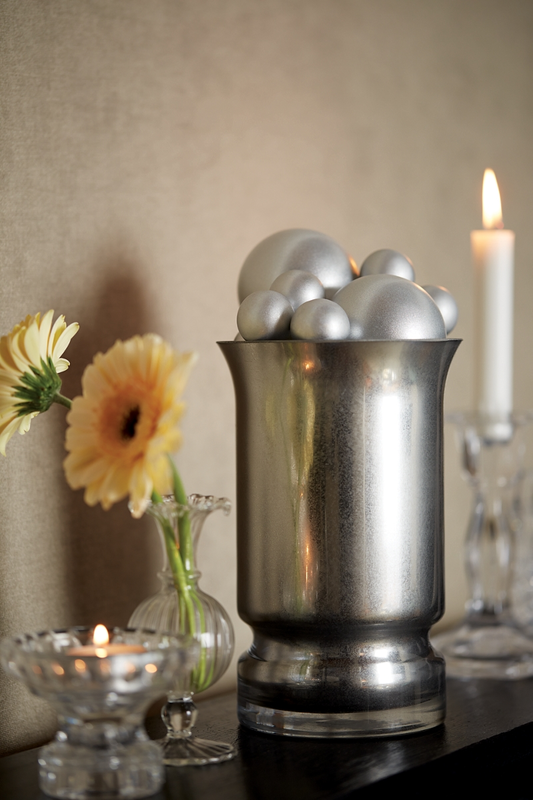 Spritz very light coats Krylon® Shimmer Metallic in Metallic Silver down inside the vase. Spray with the can 4-6 inches from the opening of the vase and only spray for a few seconds. Rotating the spray angle to get all sides of the vase. Let dry. Spray several light coats of Krylon® Looking Glass Paint inside the vase allowing the paint to dry thoroughly between coats. Continue adding coats of paint until the desired look is achieved. For a really old mirrored finish add a light spray of Krylon® ColorMaster™ Paint + Primer in Sating Brown Boots. Just little flecks of the brown color will age the mirrored finish.